First Christian Church Martinsville is a caring congregation, joined together in love and faith, serving God by serving the community. By acknowledging the spiritual worthiness of all, we will encourage deepening relationships with Christ, one another, and our diverse world, revealing the joy of God’s love. We believe that to be Christian is to follow Jesus in all that we say and do. Everyone is welcome at our Church and at the Lord’s Table as we move to answer God’s call. Being actively involved in our community is core to our values as Church. 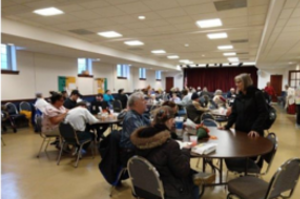 In 2005, First Christian Church began serving a free dinner on Monday evenings to anyone wishing to partake. Each week, we welcome community guests into our spacious fellowship hall for a prayer of thanksgiving, hot meal, and dessert. Companionship and conversation are abundant during this time of sharing; we now welcome over 100 men, women, and children each Monday. In 1998, The Haven Youth Center was founded as a community-based not-for-profit organization serving middle school students. It is located in our building at 39 East Jackson Street, behind Disciple House. The Haven Youth Center is to provide students in grades 5 through 8 a safe place to come after school to hang out with friends, to visit, to play games, eat, study, learn new life skills and do community service projects. Kairos Prison Ministry mission is to share the transforming love and forgiveness of Jesus Christ to impact the hearts and lives of incarcerated men, women, and youth, as well as their families, to become loving and productive citizens of their communities. Kairos takes teams into prisons for weekend “retreats” and follow-up meetings. FCC also provides hundreds of chocolate chip cookies, financial and prayer support. You have an invitation to the table, Come Join Us Today! We offer four Sunday School classes for adults that meet from 9:40–10:40 a.m. between the traditional and blended worship services. Our goal is for our children and youth to find joy in being together as they praise God, and come to understand their faith. We offer a variety of programs for all ages, including Sunday School classes, Children Worship and Wonder service, Vacation Bible School, and Youth Group. If you love worshiping God through music, there are several opportunities to be involved in the music ministry at First Christian Church in Martinsville. Find Out What’s Happening at FCC! Community Table is a free meal every Monday from 5:30 - 6:30 pm, prepared and served by teams of volunteers. All are welcome to come and enjoy this time of fellowship. Today's Easter sermon is available! Like and Share to spread the word! 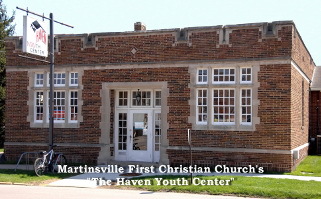 First Christian Church of Martinsville&comma; IN First Christian Church of Martinsville, IN updated their cover photo. Sermon: "He Chose the Nails"
Also, please note that worship times will return to 8:30 & 10:45 am beginning on Sunday, April 28. Also, Sunday school will return to 9:40 am. If you are seeking Christ, or are looking for a Church to call home we have an open seat waiting for you. Become part of our Church family and discover how God can help you find answers to your life questions. First Christian Church of Martinsville is part of the Christian Church (Disciples of Christ), a denomination of more than 3500 congregations across the United States and Canada. As part of the one body of Christ, we welcome all to the Lord’s Table as God has welcomed us.